In a nutshell, altocumulus mamma clouds can be defined as middle level clouds which contain a considerable amount of moisture. One defining characteristic of altocumulus mamma clouds is that they normally form very fast. It's very common to see the presence of altocumulus mamma in a sky which was previously clouded, or which had different types of clouds. This aspect of altocumulus mamma clouds has lead to them being described as clouds which invade the sky very fast. Altocumulus mamma clouds normally contain a large amount of precipitation, which means that they are significant in terms of aviation and can also be used to predict the presence of rain in a number of occasions. 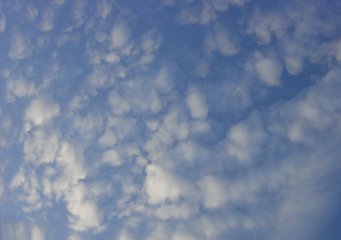 What height are altocumulus mamma clouds found? These clouds are classified as middle level clouds which usually form at between 6,000 and 16,000 feet above sea level. For this reason, they are classified as middle level clouds. How are altocumulus mamma clouds formed? Air that has too little water in it would need much lower temperatures to cool. This means that the air would have to move to much higher altitudes to be condensed properly. Air that has too much water would need relatively higher temperatures to condense. This means that for heavily saturated clouds, the condensation can occur at an altitude much lower than that which is needed for altocumulus mamma clouds. Other factors such as physical barriers such as mountains which force the air upwards, and convectional currents that do the same also have a role to play. Apart from that, the presence of cold air fronts which cool the air down and causes it to condense also has a major role to play in the formation of altocumulus mamma clouds as well. What do altocumulus mamma clouds look like? As the name would suggest, altocumulus mamma clouds normally have protrusions from the base of the clouds. Such protrusions resemble breasts, and this is why they are given the species name mamma. How common are altocumulus mamma clouds? In terms of chances of being seen, altocumulus mamma happen to be one of the most common categories of clouds. This is especially so in regions that experience cold air fronts which force the moisture laden air to cool. Typically, altocumulus mamma clouds usually form and dissipate very fast. However, they do this many times a day which means that you are more likely than not to see one. Where can I see altocumulus mamma clouds? Altocumulus mamma can be seen in many temperate zones in the world.